KISST Organics Health & Wellness Blog - A Fever Is A Good Thing! A low fever can actually benefit a person who becomes sick. Researchers have attributed parental tendencies to over-treat by “fever phobia”–a fear that fever is harmful–which they say originated after the introduction of anti-fever drugs like Tylenol. In addressing this important concern of parents, it’s vital to understand that a fever serves to protect your body against infection and trauma in three major ways. 1. A fever stimulates your immune system into producing more white blood cells, antibodies, and a protein called interferon, all of which work to protect your body against harmful microorganisms. 2. By raising your body’s temperature a few degrees, a fever makes it harder for invading bacteria and viruses to survive and flourish. The higher your core body temperature is, the harder it is for harmful microorganisms to survive in your body. 3. A fever helps to shuttle iron to your liver so that it is not readily available to fuel the growth of invading bacteria. Longstanding belief, and even parental instinct, may compel you to fight your child’s fever to ease the persistent crying and discomfort. But most experts say not to worry so much about treating your child’s fever. 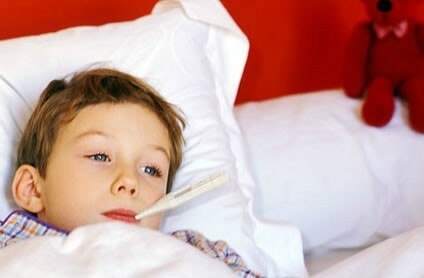 In fact, they say, for children older than six months old, having a fever may be a good thing. Instead, many experts said comforting a child through a fever is an effective way to help a child get over a fever faster. Simply rocking your child in your arms or trying to keep him or her quietly distracted helps. The most common cause of a fever is a bacterial or viral infection, the vast majority of which your body’s self-healing mechanisms can conquer with proper rest and nutritional support. Heat stroke and poisoning can also cause fevers, more often in children than in adults. A fever can actually help anyone who is sick . When you get a fever, the body is basically doing it's part in eliminating bacteria, bugs and viruses. And contrary to what parents may believe, the body can function very efficiently at temperatures as high as 100.5 degrees. A fever cannot cause brain damage unless it reaches 107.6 degrees Farenheit (42 degrees Celsius) and stays there for an extended period of time. Since your brain has a built-in thermostat that does not allow your core temperature to rise above 106 degrees Farenheit (41.1 C) during an infectious process, it’s virtually impossible to experience brain damage from a fever caused by a bacterial or viral infection. The majority of fevers don’t reach 105 (40.5 C) degrees. The highest temperature that I have encountered thus far has been 104.5 degrees Farenheit (40 C) in a 6-year old boy who had suffered a heat stroke. A small percentage of children can sometimes experience short-lived seizures when they have a fever, called a febrile seizure. These seizures are caused by a rapid increase in body temperature, not by a specific temperature. There’s no need to worry if your child experiences a febrile seizure, as they end quickly and do not leave after-effects. If none of the above symptoms are present, a fever is best treated by getting plenty of rest, drinking plenty of healthy liquids and eating lightly. Many holistic practitioners even reccommned increasing your core temperature by taking a hot bath in baking soda and epsom salt to help detoxify the body and get sweat glands cleaned out and working properly. Once you reach the point where you are sweating profusely, rinse off in tepid to warm water and go straight to bed. By increasing the body's core body temperature it helps fight off the illness and increase antibodies. The epsom salt and baking soda bath will help relax so that you can sleep and thefever will usually break within 8 -12 hours. Please be aware that though the risk is very slight, there are potential negative effects to taking anti-fever medications, especially in little ones, so heed all warnings on labels and stay vigilant with symptoms.